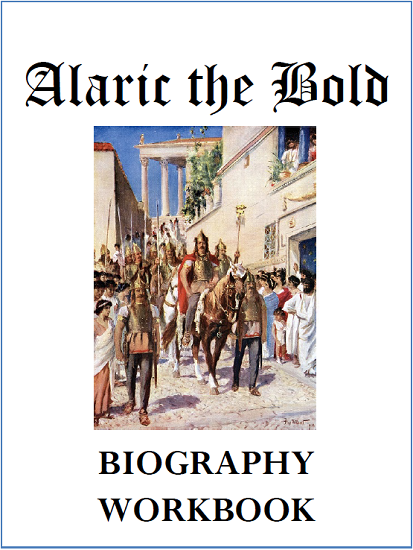 Alaric the Bold (360-410 CE): Learn all about this famous and powerful leader of the Visigoths (Western Goths), who conquered ancient Rome, as well as about the rise of Christianity and end of gladiatorial combats. This workbook, part of our Biography Workbooks series, is nine pages in length. It is full of questions and activities throughout its informational text. Click here to print. The answer key is below. This is designed for use by high school students studying World History or European History. Answer Key - 1. Danube; 2. B - Greece; 3. To pacify him; 4. Answers will vary; 5. April 4, 402; 6. C - 404; 7. Telemachus; 8. Honorius; 9. B - False; 10. Attalus; 11. A - True; 12. Answers will vary; 13. Spain; 14. Answers will vary; 15. D - Telemachus; 16. A - Colosseum; 17. B - False.